Hi, I'm Debbie from One Little Project, and I am so excited to be guest posting on Be Different Act Normal! My blog, One Little Project, is full of tutorials for life as a mom... one mom + one house = one little project at a time. 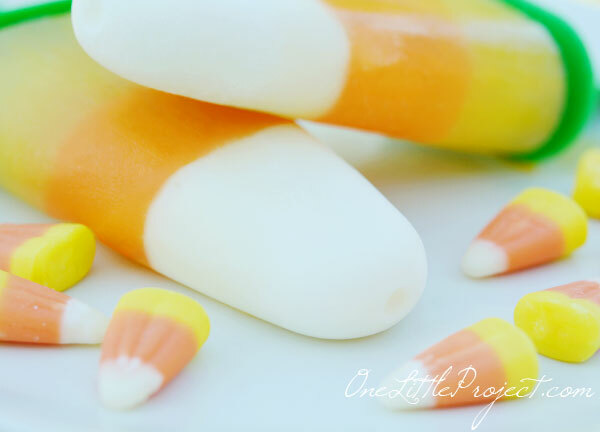 Today I'm going to share a tutorial for making Candy Corn Popsicles. Okay, they aren't really candy corn flavored, but they have the classic candy corn shape and colors and they are actually incredibly healthy! I bought orange carrot juice, pure mango juice, and pineapple juice. You don't have to use exactly what I'm showing here, but if you want your orange colored section to actually be orange, it's best to have something with a little bit of carrot juice in it. The ingredients are simple - vanilla yogurt (and yes, one little container was plenty), orange carrot juice, and mango juice. I chose the mango juice over the pineapple juice because it had a brighter color. It also turns out that frozen mango juice is delicious! I picked up these little popsicle holders from IKEA this summer for $2. They are fantastic, and almost the exact shape of candy corn, which was an added bonus. Since I had to pour the yogurt into the popsicle containers, I wanted it a little bit runnier. I watered it down with 2 or 3 Tablespoons of milk until it poured easily. Hold it up to the light to see how full it is. I let those set in the freezer for 1 hour and then added the orange carrot juice. Again, it was easiest to see how full they should be when I held it up to the light. You can see the fun contrast of the colors through the plastic here already! Then I let the juice set in the freezer for an hour and 20 minutes. I'm not going to lie, I had to make these twice because the first time I only let it set for an hour and my top two colors blended together. You need to wait until the middle layer is semi-solid, which is tricky. It has to be solid enough to not mix, but not so solid that you can't get the stick in. Once I added the mango juice on top, I pushed the stick through and let them freeze over night. Since it took two tries to get these right, I was super happy when this batch turned out well! It turns out that frozen vanilla yogurt tastes amazing. Even if you don't have the energy to make popsicles with layers, I highly recommend making them out of vanilla yogurt, milk and mango juice mixed together. Delicious! I'd happy if you'd come on over to visit One Little Project to check out more fun tutorials and recipes just like this one. Thank you so much for having me Lorie! Oh, these are too cute. My kids would LOVE them! My son would love these these.